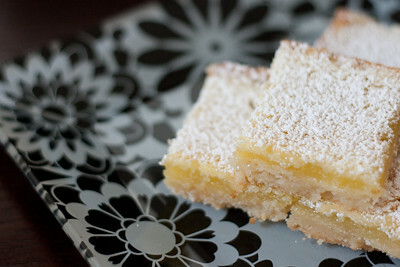 This week's Sweet Melissa Sundays (SMS) recipe was chosen by Rebecca of Indecisive Baker: Toasted Almond Lemon Bars. I love a good lemon bar - there is just something to be said about a crumbly shortbread crust and sweet, tart, lemon filling! Melissa's shortbread crust is actually an almond shortbread crust. This, along with the almond extract that is added to the filling sets it apart from traditional lemon bars. I really think the almond extract added an extra dimension to these bars so please don't skip it if you make these! I actually had some issues with my crust. I froze my crust for 1 hour before baking, and even then my pie weights (old socks filled with rice) caused the dough to stick to my foil! Next time I will butter the foil before covering the crust. Luckily the crust took longer than the indicated 20-25 minutes to bake because I was able to scrape the dough that was stuck to the foil (which would have left a big hole in my crust!) and put it back into the pan! I then continued to bake the crust, uncovered, for another 10 minutes or so until it was lightly golden brown and baked through. The filling was a cinch and I had no issues there, though I wonder if I maybe whipped the eggs a little too much because I did end up with a little bit of a bubbly crust on top. It didn't matter though, as it did not affect the taste of the lemon bars and I was able to cover the top up with the powdered sugar. 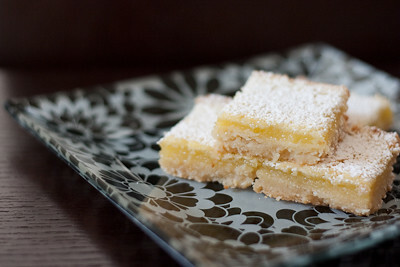 All in all, I enjoyed these lemon bars and will definitely be making them again. If you're looking to make some fancy lemon bars, try these Slammin' Citrus Squares which are lemon bars topped with white chocolate lemon balm icing. The filling also contains orange and lime zest which gives it an added little zip! Thanks Rebecca, for hosting this week. If you would like the recipe, you can find it here. 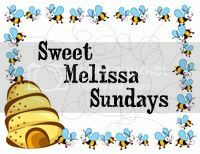 Make sure you check out the Sweet Melissa Sundays Blog Roll to see how everyone else enjoyed these sweet, tart treats. - I would recommend freezing the crust for at least 1-2 hours before baking. Then, butter the foil before covering the crust and putting it in the oven. If you freeze the dough long enough, you will not need to use pie weights when baking. - My crust took about 35 minutes to bake, not the indicated 20-25 minutes. Wow,these look awesome. I love the plate you used in the photo too. Thanks for sharing your tips with the crust...will definitely incorporate that into my next attempt at baking this recipe. Your bars look delicious. I like your plate, too. Totally agree the crust was a challenge and greasing the foil or parchment is a must. I am bookmarking your other recipe, can't wait to try it. Lovely lemon bars and great plate. I am always looking for plates with style like yours. Glad you were able to save the crust. Mine actually ended up a little too dark when I made these last. Thanks for the suggestions if I were to make them. I normally bake my bar crusts uncovered and they seem to be okay. I have yet to make bars in my new apartment so I'll see about that. They look great though! I used wax paper to cover my dough but that stuck too. Bah! Your bars still look fab despite the crust disaster! They look great! Pretty plating. I also didn't use weights and even without freezing, didn't have a poofing issue. Despite your issues, your bars look perfect. These bars look perfect! I've read around about problems with the crust, still think I'm going to give this one a go! I think I whisked my eggs a bit too long also as my filling even baked up bubbly on top. OH WELL! Still tasted divine!! Your bars look absolutely great! I'm always on the look out for new lemon bar recipes. They sound right up my alley as I really enjoy almond and citrus together. They look great! Not at all like you had any issues.